Email Address Policies are bread and butter in Microsoft Exchange world. If you work with On-Premise Exchange 2007, Exchange 2010, Exchange 2013/2016 you most likely set it up more than once. Unfortunately if you're Office 365 Exchange Online Administrator and don't have On-Premise Exchange in Hybrid scenario to use, Microsoft doesn't give you any GUI option to do this except editing email addresses one by one. Doing any modifications via PowerShell is also gonna set you back couple of hours as well. 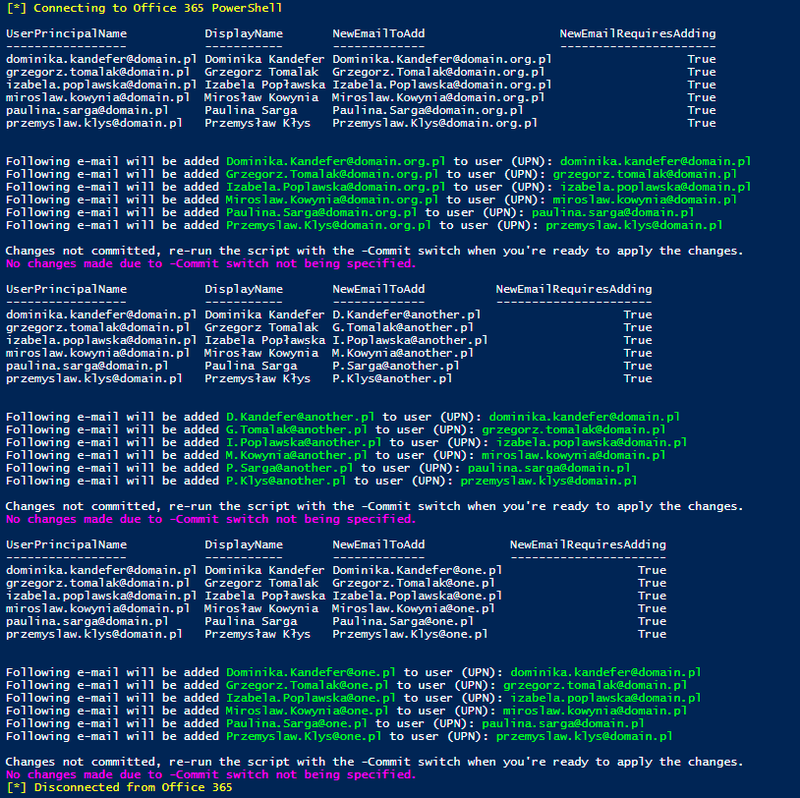 Recently we've been asked by customer with 20 accounts to create and manage on Office 365 with multiple domains and I didn't want to spend hours on manual labor creating it, I've decided to write a little script that does that for me. Hope you will find it useful in your scenarios. Script takes similar approach known to Microsoft Exchange administrators and allows easy configuration of Email Address Policies based on templates. Add-EmailAddressToUsersFromTemplate -EmailTemplate "%g.%s@company.org.pl" -Commit $false -ExcludeUsers "company@companykatowice.onmicrosoft.com","kalendarz@company.org.pl"